Jaromir Jagr played for nine teams during his 1,733 game NHL career. But would you believe us if we said it was almost ten? 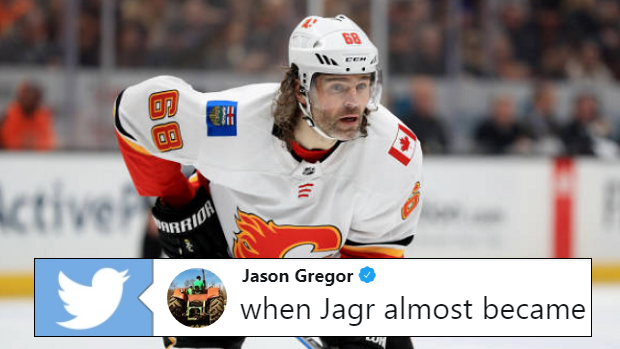 Jagr finished his playing days with the Calgary Flames in the 2017-18 and it nearly wasn’t the first team from Alberta that he laced’em up for, according to former Edmonton Oiler Jason Strudwick. TSN 1260's Jason Gregor had Strudwick on his podcast The Jason Gregor Show to discuss the time during the 2008-09 season that Jagr almost became an Oiler. Strudwick recalled Jagr being one loss away with the KHL’s Omsk Avangard from making an early return to North America. Well that’s pretty interesting news! Let’s remember for a second that Jagr was still an extremely effective player during this time. Despite being older than 36 at the time, the Czech native posted a 71 point campaign with the New Rangers the previous season. He would go on to play two more seasons with Omsk Avangard before eventually returning to the NHL where he played with the Philadelphia Flyers in 2011. It’s also worth noting that the Oilers were just a few years removed from a Stanley Cup appearance and still possessed skilled players such as Ales Hemsky, Shawn Horcoff and Dwayne Roloson. Edmonton ultimately finished with a 38-35-9 record and missed the playoffs. They wouldn’t make it back to the postseason until 2017. It would have been nice to see Jags play for another Canadien team but then again, his presence could have interrupted the massive butterfly effect that ended up landing them Connor McDavid. At 46 we’re not entirely ruling out the possibility of Jagr making it all happen still.